A warming bowl of soup, perfect for those wet, and distinctly unspring-like, April days. 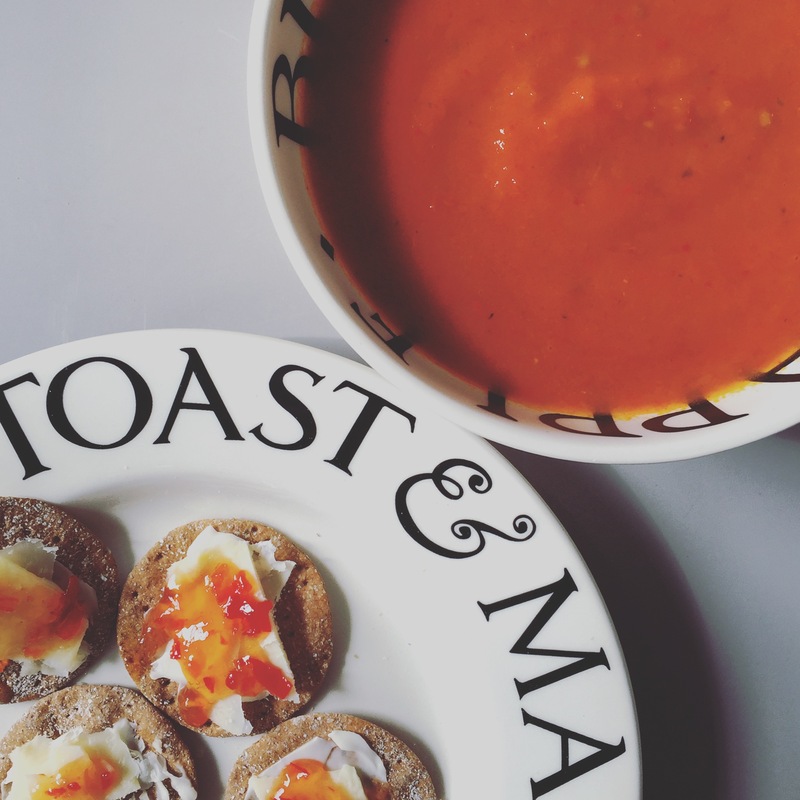 Try this delicious and flavoursome bowl of soup, served here with Peter’s Yard crackers, topped with shavings of cheddar cheese & chilli jam. I use chicken stock as a base for this soup, but vegetable stock can be used as well and will taste just as good. 500ml stock – check out my chicken stock recipe, or use any branded stock cube you can find in the supermarket, I like Knorr. Prepare your stock in a large pan, leave to cool with the lid on. Cover the vegetables with parsley (roughly chopped if fresh) and drizzle the whole tray with good quality olive oil, then season with salt & pepper. Roast the vegetables in the oven for about 40mins, until the carrots are soft. Add the vegetables to the stock and blitz with a handheld blender until smooth. I use the Kenwood Soup XL. Add a little more salt and/or pepper if required. Heat the soup right the way through on the hob and enjoy, or dish it up into tupperware portions for the freezer. Next Brunch with Badger & Co.
Looks delicious. Please bring a Tupperware filled when you come home next?